The HTC One M8 today joins the might of the Samsung Galaxy S5 and Sony Xperia Z2 in the mobile market, with each set to do battle and attempt to cement its place as 2014’s most popular high-end handset. Here, we take a closer at the Big Three, including specs and form factor, in order to try and determine which of these humdingers will emerge victorious once the retail battle commences. With HTC having just launched its latest and greatest, we now have three brand new smartphones on the horizon, and each will be vying for the coveted position as Android’s top dog. Samsung’s Galaxy S range has been the undisputed king of the top-end Android market during the past couple of years, but with HTC having made some notable ground up on its Korean rival last year, the Taiwanese outfit will be looking to consolidate its position as a big-timer once again. Sony, meanwhile, is the clear underdog, but having been impressed by its credentials after the MWC launch, we’re certainly not going to write it off just yet. So, let’s start with the similarities. Each device packs in a solid Qualcomm Snapdragon 801 quad-core processor with at least 2GB of RAM, although the Z2 comes with 3GB of RAM. 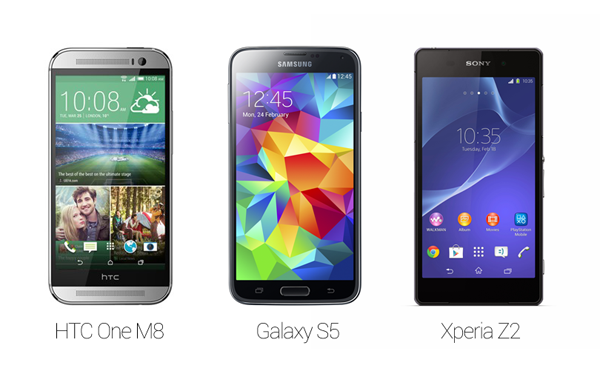 The clock speeds vary slightly between each device even though the processors are the same, but while there are many variables that determine general performance, you can be fairly sure that whichever of these three handsets takes your fancy, you’ll enjoy a slick overall experience on the very latest Android 4.4.2. 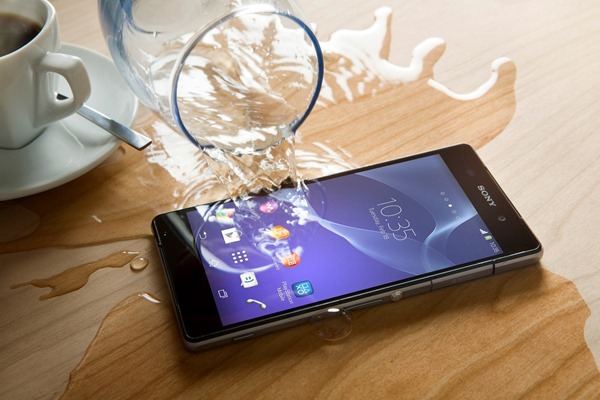 The Galaxy S5 and Xperia Z2 are waterproof – but oddly the HTC One M8 doesn’t carry an IP protection tag – and as such, users are more likely to take them out through more adventurous terrain. In these instances, it’s always good to have a solid camera, and this is one area in which Sony, Samsung and HTC have clearly sought to improve things. The 4K video capabilities of the new Xperia Z2 and Galaxy S5 have been well-documented, and while the HTC One M8’s double-whammy of 4-megapixel shooters offer, it is claimed, some innovative technologies and better image focus, we’ll reserve firm judgment until we have some evidence of its point-and-shoot credentials. For right now, though, the Sony and Samsung handsets should definitely appeal to the amateur photographer, and if the HTC One’s camera was anything to go by, so should the M8. As you can see from the table, there’s really not much to call between these devices, and precisely which handset you decide to pick should be based upon personal preferences and requirements. What we’re saying here, is that no one device is clearly better than the others, and while you’ll have to forgo certain features on whichever road you decide to take, it’s up to you which features they will be. For example, the Galaxy S5 offers the versatility of being able to remove the battery, which is an oft-essential feature for power users. But one could argue that while the HTC One M8’s unibody is restrictive in this regard, it’s considerably easier on the eye than the S5. Similarly, if you go for the metallic finish of the new HTC, you’re at risk of picking up scratches, which may then, in turn, sway you towards the Sony Xperia Z2’s glass finish. The table is provided only as a guideline to the decision-making process, and if you’re still unsure, we’d highly recommend waiting until you can try each device out through in-store demo. This will give you a first-hand opportunity to get a proper feel for each handset and in turn, form a decision that you’re less likely to regret in the long run. 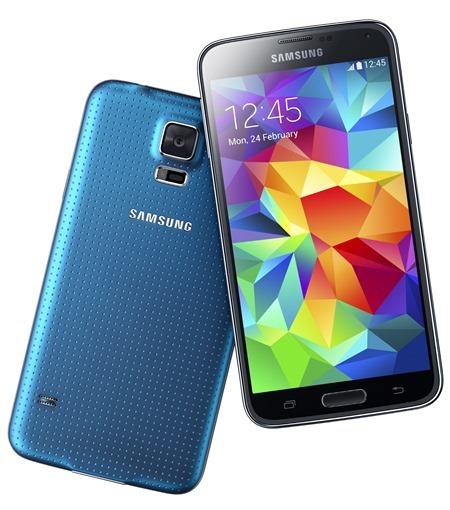 Still, from a sales point of view, it’s likely that Samsung’s Galaxy S5 will edge it, beating out more stern competition from the HTC One M8. Even though sales of the 2013 HTC One were impressive, the Samsung brand is still incredibly strong, and while some disgruntled consumers have cited the Korean company’s lack of innovation with the S5, it should still be enough to carry the flag. Sony, meanwhile, has struggled somewhat to keep up with the rest of the field, and while the Z2 is as good as its two main competitors in almost every way, we found it still to be missing that ‘wow’ factor in our video review. Which one of these devices has won over your affections? Do you like the feature-rich new Galaxy S5; the sleek elegance of the Sony Xperia Z2? Or perhaps you now have your heart set on the HTC One M8 and its curvaceous, high-end finish? Whatever the case, please do share your thoughts with us below!